You may have heard of candida albicans before. We all naturally carry around some of this common yeast in our gut. Most of the time we peacefully coexist. But certain things can cause the fungus to overgrow, triggering troubling symptoms. For instance, antibiotics, a sugar-heavy diet or a suppressed immune system can all be to blame. The experts have been fighting among themselves for years about how common candida overgrowth is. They can’t even agree on exactly what effects it has on our health when it starts to spread. But one thing is for sure. There is no doubt some folks do fall victim to candida. But one of the biggest controversies surrounding candida is exactly what its link is to cancer. Candida infections are fairly common in folks who are being treated for cancer. For years most researchers believed the yeast was simply taking advantage of cancer patient’s already compromised immune systems. 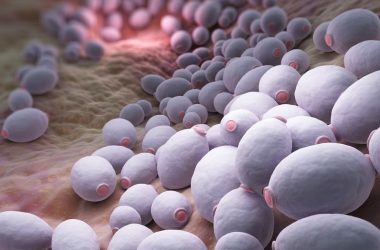 The debate is a long way from over, and research into the cancer and candida connection is just beginning. And we have a long way to go before we truly understand the relationship between the yeast and cancer. But one thing everyone can agree on is an overgrowth of this opportunistic fungus isn’t good for anyone. Which means managing your candida levels is a wise choice. And it turns out there are a few common foods that can help us do just that. You probably know by now we’re big fans of coconut oil around here. Well it turns out this awesome oil is a natural antifungal. Coconut oil is rich in capric and lauric acids, both of which can reportedly help put up a fight against candida. Coconut oil is affordable, has a long shelf life and is great for cooking (it’s heat stable, meaning no unhealthy trans fats to worry about). Look for a high-quality, virgin organic oil. And aim for two to three tablespoons a day. Garlic doubles down in the fight against candida. A natural antifungal, garlic is rich in bug-busting allicin4 and diallyl disulfide. To get the most out of your garlic be sure to choose organic and eat some of it uncooked. When using garlic in cooking you can boost its effectiveness by letting it sit for at least ten minutes after crushing or mincing it to increase its allicin content, and make it more stable during cooking. We’ve told you before about horseradish’s effects against cancer. (If you missed that report click here to catch up.) Now there’s another reason to add this powerful herb to your menu. It turns out horseradish may be an effective candida killer. To harness horseradish’s candida-slaying ability avoid the grocery store junk. It’s typically packed with sugar (both candida and cancer thrive on sugar). Make your own using fresh horseradish root (you’ll find a recipe here) instead. Stir some into burgers, meatloaf, tuna salad, deviled eggs or even mashed cauliflower. 8. “Glutathione protects Candida albicans against horseradish volatile oil,” J Basic Microbiol. 2016 Jun 7.